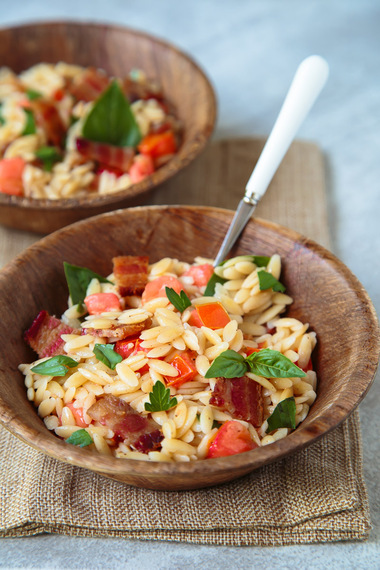 Warm bacon tomato pasta salad is quick and easy, and perfect for BLT lovers. We especially love the bacon vinaigrette! Have you ever been to a steak house and started your meal with spinach salad with a warm bacon vinaigrette? Man, I love that salad. Spinach really shines when coated in bacon grease, doesn’t it? It almost makes you forget you’re eating something green that’s good for you. It got me thinking that spinach isn’t the only vegetable that could use a bath in bacon. I think warm bacon dressing is ready to move into the spotlight with tomatoes. The method is similar to making a regular vinaigrette, but instead of streaming in the olive oil or other oil you would normally use in a recipe, we save the bacon grease from the skillet to use instead. Not only is it delicious, the warm oil incorporates seamlessly into a vinaigrette. If you’ve got a garden overflowing with tomatoes, you can pull together this easy pasta salad with ingredients you probably already have in your pantry. I have basil and parsley growing next to my tomatoes, so I grabbed a handful of each, but whatever herbs you would like to include is fine. The same rule applies with the pasta shape—any kind of pasta in your pantry will work fine in this recipe. And in a pinch, canned tomatoes will work great, too. 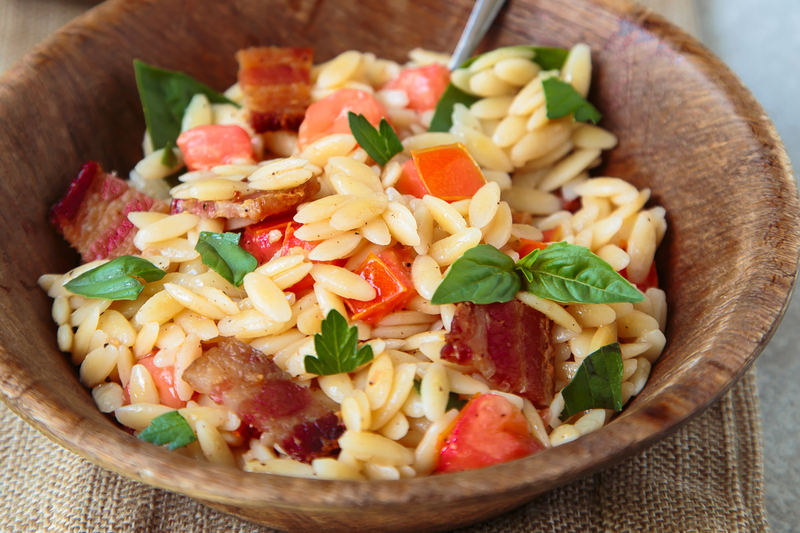 To make this pasta salad as easy as possible, get the bacon going first. Then, while the bacon cooks, bring the water to a boil to cook the pasta. Then, chop the vegetables and herbs, and add them to the serving bowl. Since the pasta needs to be tossed in the vinaigrette while both are still warm so that the pasta absorbs the dressing, cooking everything at the same time is ideal. That way, all it takes is a quick drain of the pasta before combining everything. Oh, Christina. Such a temptress! We think this salad would make a great meal alongside Shaina's braised beef shanks and some of Stephie's Red Lobster biscuits. Yum! Get the Bacon Tomato Pasta Salad Recipe on Food Fanatic! Christina grew up in Texas, but now lives in Missouri. You may know her best for her Dessert for Two, but here on Food Fanatic, she's famous for her fantastic Dinners for Two.